Gagasi FM Live Streaming Online from Durban South Africa . Enjoy Listening over 70 South Africa radio stations online . Listen to South African Latest Music , Latest News , Talk Shows and feel home . If You are using Apple products like iPad or iPhone use Google chrome or safari browsers .Please wait for 30 Seconds to listen this station(Player loading may take 30 Seconds) . In Some devices FM may not start automatically , press play button to start listening to the station. This radio station broadcasting in Durban and surrounding areas in KwaZulu Natal, South Africa.This Station broadcasts R&B, Afro pop, hip hop, house and kwaito . This is only English and Zulu radio station in the country.The station had 1 million listeners during its first year of operation . Gagasi FM djs are famous in South Africa. 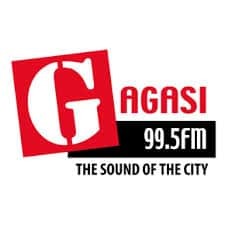 Gagasi FM is a contemporary radio station with a strong local identity and is the only bilingual commercial radio station in KwaZulu Natal , broadcasting in both English and isiZulu . Physical Address : 6 Zenith Drive , Solstice, Umhlanga New Town Centre, 4319.